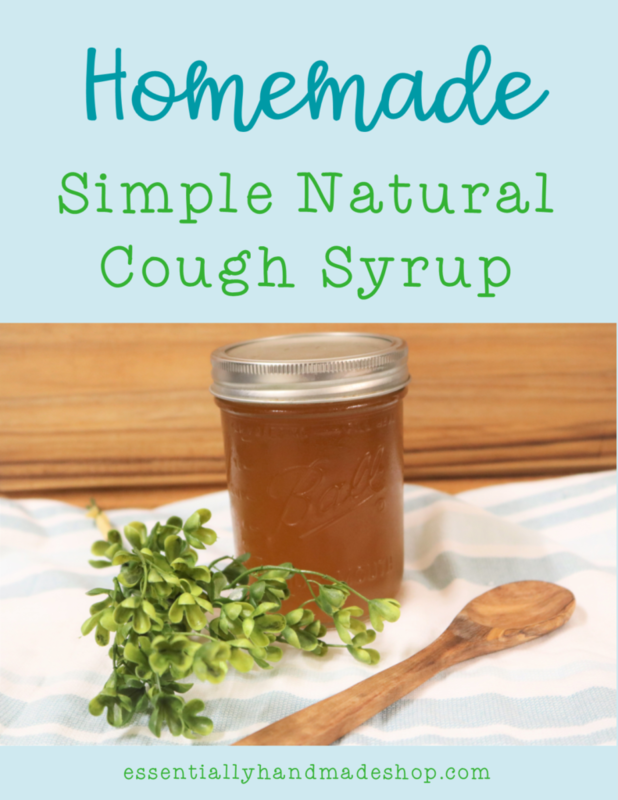 simple homemade all natural cough syrup with this recipe! I’m a bit of a crunchy mama, so store bought, big pharma medicines are not my favorite. 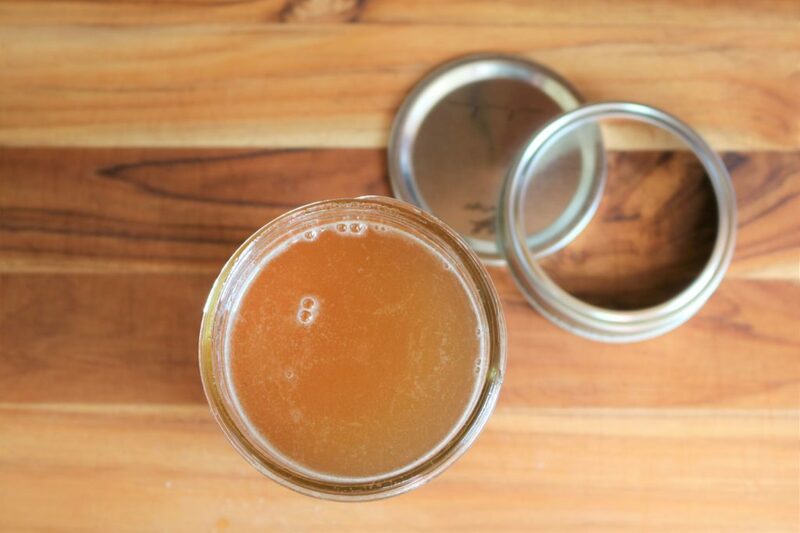 This simple homemade cough syrup recipe is my solution. 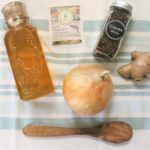 I loved the idea of creating something that would help my family during cold and flu season without pumping all of us full of crazy chemicals. 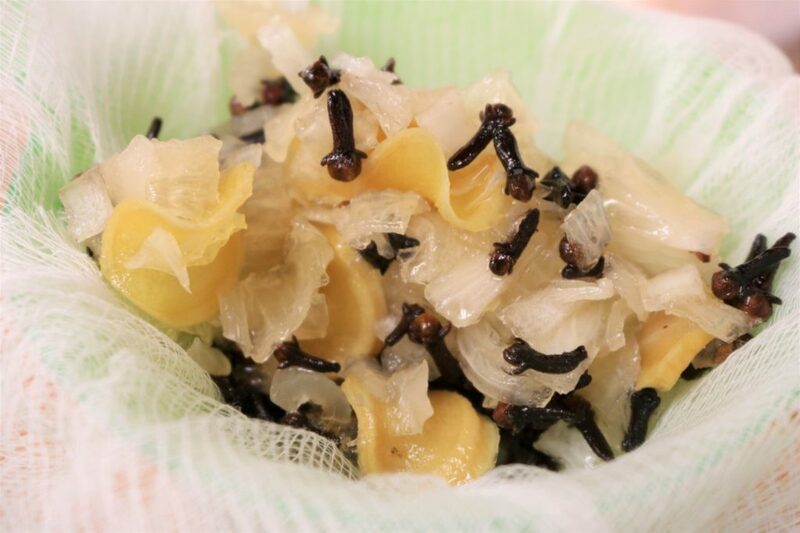 Whenever any of us get a cold or cough we head to the fridge and take a couple of spoonfuls of this homemade cough syrup to get some relief. 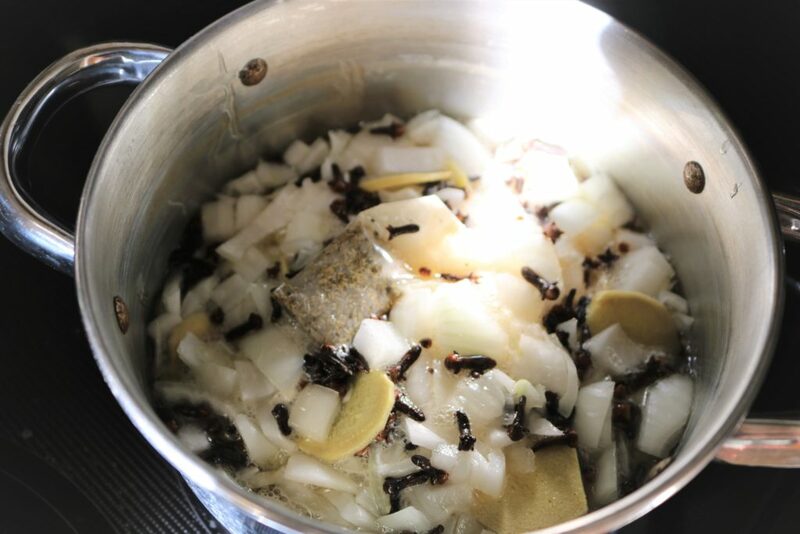 I chose my ingredients based on their natural ability to provide relief to common cold and cough symptoms. 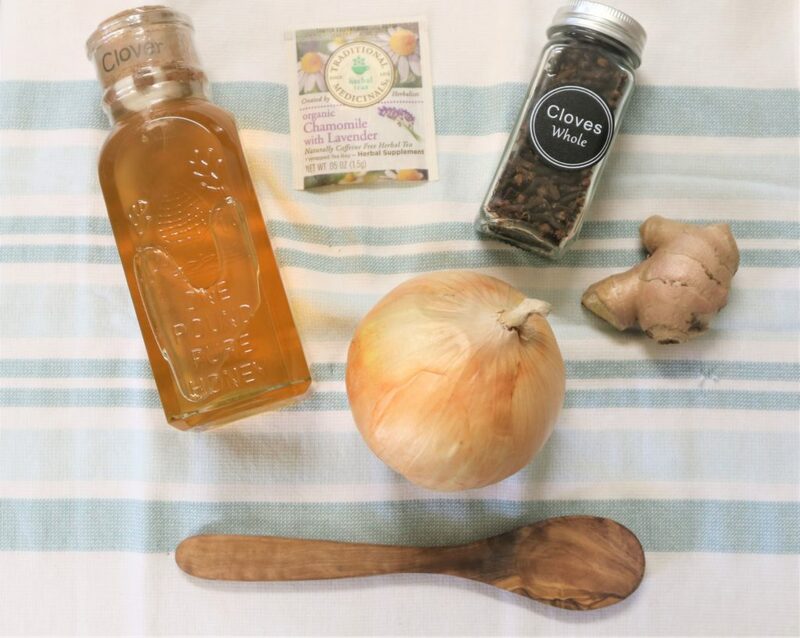 Honey is a natural throat soother, chamomile is known to boost immunity and is relaxing, cloves are a known antioxidant, ginger helps with nausea and muscle aches, and onions are another antioxidant with anti-inflammatory traits. Next step, chop the onion and ginger. Then, put them into the sauce pan. 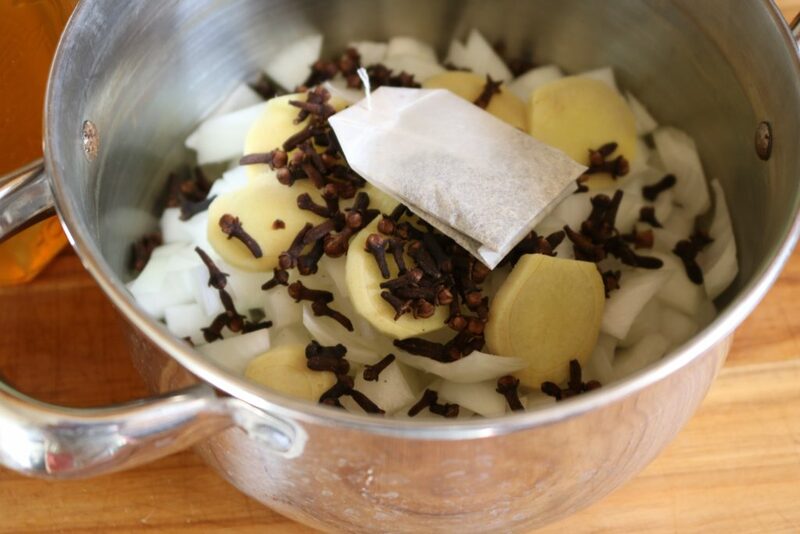 Next, add the cloves and tea bag. Finally, drizzle the honey over the top of everything. Bring the mixture to a boil while stirring. Once you’ve reached a boil reduce the heat to simmer for 20 minutes. 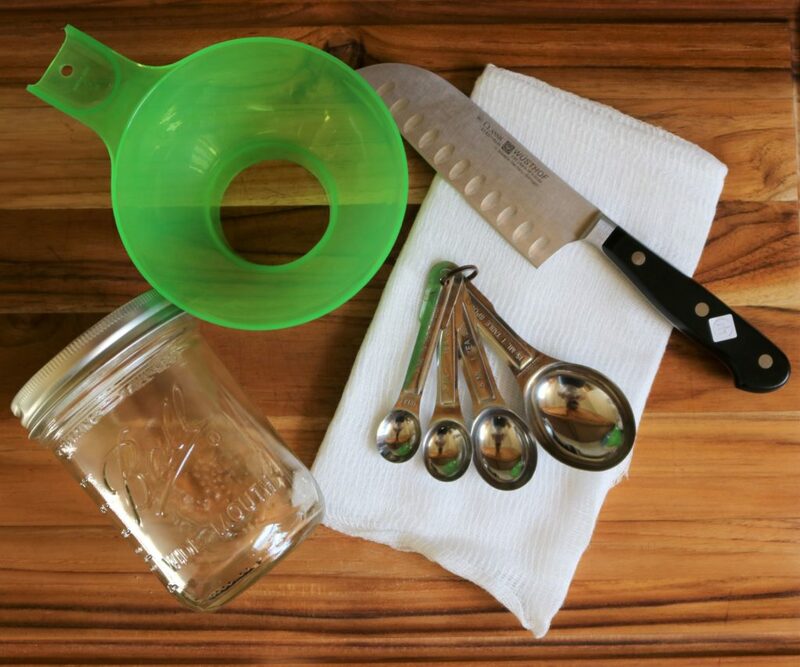 Let cool for a few minutes then strain through the cheese cloth while pouring the cough syrup into a mason jar. Last, let it cool and store in the refrigerator. 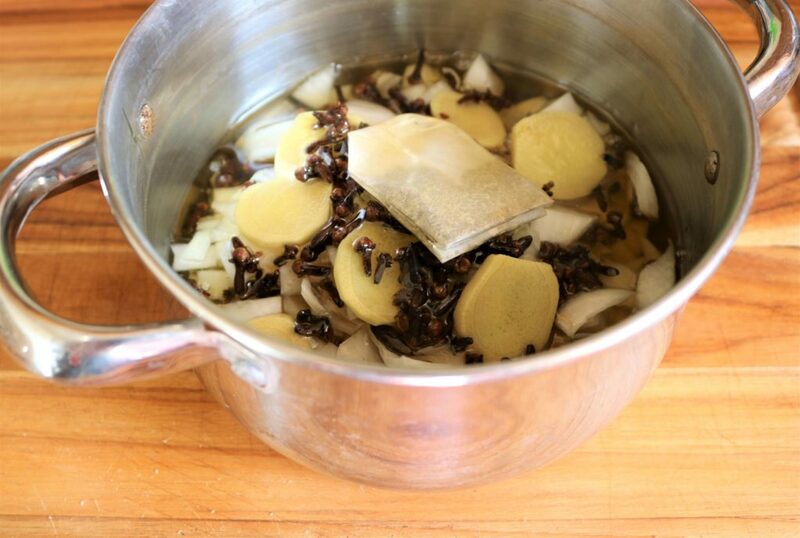 Use 1-2 tablespoons as needed to help relieve cough and congestion symptoms. 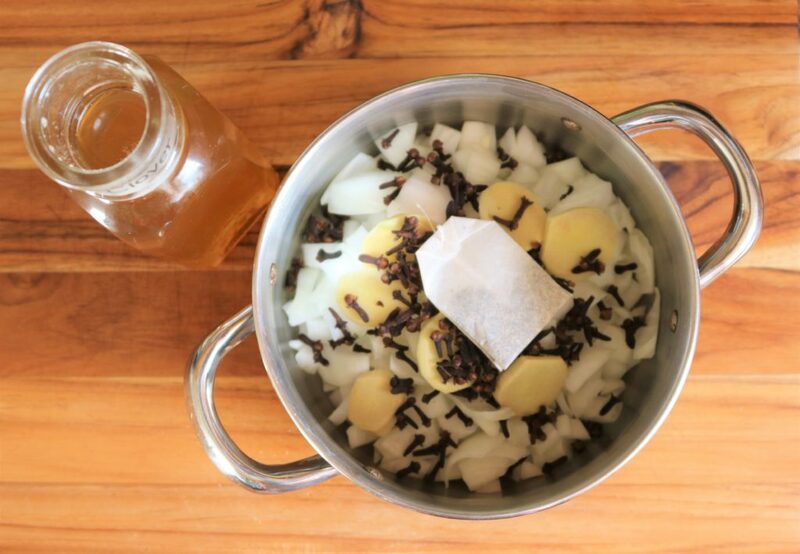 This homemade cough syrup will give relief to your cold and cough symptoms. First, chop the onion and ginger. Then, put them into the sauce pan. Next, add the cloves and tea bag. Finally, drizzle the honey over the top of everything. Bring the mixture to a boil while stirring. Once you've reached a boil reduce the heat to simmer for 20 minutes. 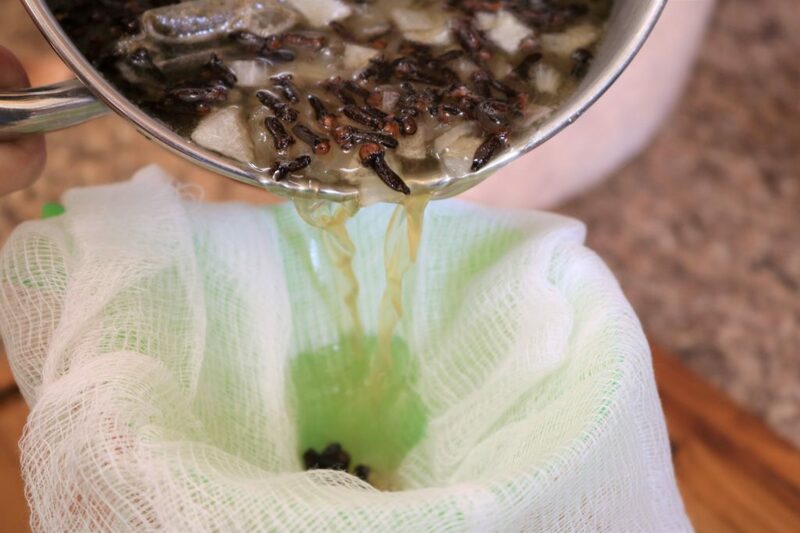 Let cool for a few minutes then strain through the cheese cloth while pouring the cough syrup into a mason jar. Last, let it cool and store in the refrigerator. Use 1-2 tablespoons as needed to help relieve cough and congestion symptoms. 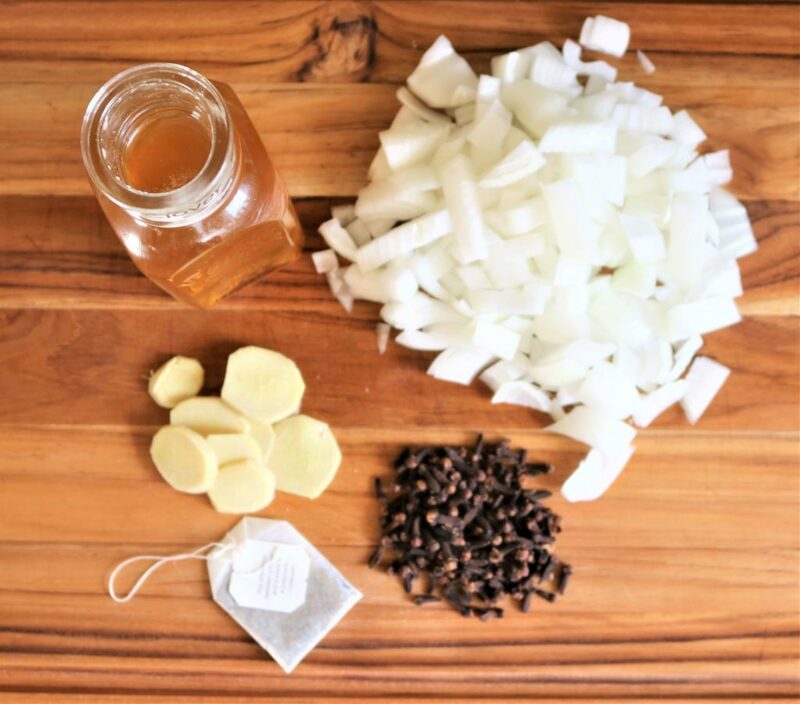 This recipe is intended to help families find an alternative to traditional cough syrups. I am not a doctor or medical professional, just a mama trying to find solutions for her family in a more natural way. Do your own research to make sure this cough syrup is right for your family. I have provided a few links for the ingredients and tools I used, but you can find most of these ingredients at your local farmers market or grocery store. Nicely done. I love posts like yours that get yo the point without a lot of (in my opinion)needless backstory. I plan to make your recipe. Thank you so much! I appreciate the feedback! I hope you love the syrup. This is great! 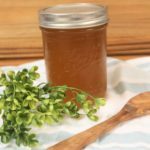 I am a crunchy mama too and we typically just use honey but this seems like an amazing recipe to try. Simple and easy enough for a mama of four to make. Thanks and will let you know how it turns out for us! I hope you love it! I’ve got my family trained to use it.